CORTE MADERA, Calif.--(BUSINESS WIRE)--Nov. 28, 2017-- RH (NYSE: RH) announced the opening of RH West Palm, The Gallery at CityPlace. The Gallery at West Palm integrates all of RH’s businesses – RH Interiors, Modern, Outdoor, Baby & Child, TEEN, Interior Design and Hospitality – and includes a Rooftop Restaurant, Wine Vault and Barista Bar by celebrated restaurateur and founding president of RH Hospitality, Brendan Sodikoff. 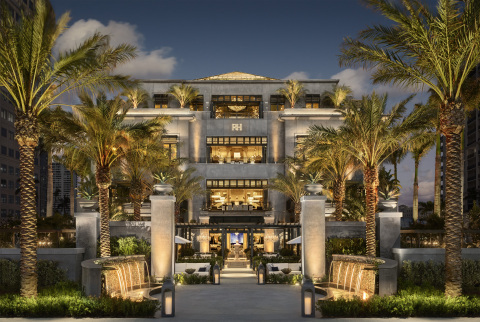 “RH West Palm reflects our quest to revolutionize physical retailing, blurring the lines between residential and retail, indoors and outdoors, home and hospitality, seamlessly integrating food, wine, art, and design,” said RH Chairman & CEO Gary Friedman. Mr. Friedman continued, “Imagine valet parking your car in front of a 14-foot-high wall of water inspired by the famous fountain in New York’s Paley Park while admiring a 70-by-140-foot ancient text-based installation by renowned contemporary artist, RETNA. Wandering through tropical gardens featuring our expansive line of outdoor collections, and navigating three floors of interior installations while envisioning the home of your dreams with one of our interior design professionals. Dining under a soaring glass atrium with heritage olive trees and listening to the sound of trickling fountains in our rooftop restaurant. Enjoying a glass of Rosé or Cabernet in our dramatic Wine Vault, or ordering your favorite coffee drink and grabbing a pastry from our Barista Bar. It’s an experience that activates all of the senses and cannot be replicated online,” concluded Mr. Friedman. RH West Palm marks Friedman’s ongoing collaboration with design architect James Gillam of Backen, Gillam & Kroeger, who have been recognized as one of Architectural Digest’s Top 100 architecture and design firms in the world. RH West Palm, The Gallery at CityPlace is located at 560 Okeechobee Boulevard in West Palm Beach. The gallery offers valet parking and can be reached at 561.804.6826. Hours of operation are Monday through Saturday from 10am to 8pm, and Sunday 11am until 7pm. RH (NYSE: RH) is a curator of design, taste and style in the luxury lifestyle market. The Company offers collections through its retail galleries, source books and online at RH.com, RHModern.com, RH Baby&Child.com, RHTeen.com, and Waterworks. This release contains forward-looking statements within the meaning of the federal securities laws, including statements related to the integrated hospitality experience at RH West Palm, The Gallery at CityPlace, statements regarding RH’s quest to revolutionize physical retailing by seamlessly integrating food, wine, art and design, and similar statements. You can identify forward-looking statements by the fact that they do not relate strictly to historical or current facts. We cannot assure you that future developments affecting us will be those that we have anticipated. Important risks and uncertainties that could cause actual results to differ materially from our expectations include, among others, risks related to the number of new business initiatives we are undertaking; our ability to introduce new products and merchandise categories that will be of interest to our customers and to new customers; as well as those risks and uncertainties disclosed under the sections entitled “Risk Factors” and “Management’s Discussion and Analysis of Financial Condition and Results of Operations” in RH’s most recent Annual Report on Form 10-K filed with the Securities and Exchange Commission, and similar disclosures in subsequent reports filed with the SEC, which are available on our investor relations website at ir.restorationhardware.com and on the SEC website at www.sec.gov. Any forward-looking statement made by us in this press release speaks only as of the date on which we make it. We undertake no obligation to publicly update any forward-looking statement, whether as a result of new information, future developments or otherwise, except as may be required by any applicable securities laws.